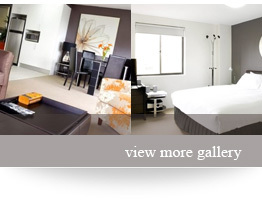 Annam Serviced Apartments is a modern, spacious, well appointed and secure apartment style hotel located in Potts Point, Sydney. We specialise in providing medium and long term serviced accommodation and guest services in our fully self contained 4 star apartments. Conveniently located within walking distance to the wonderful entertainment and dining options of Potts Point, tranquil Rushcutters Bay Park, the colourful shopping of Paddington and both St Vincent’s and St Luke’s Hospitals and only 10 minutes walk from Sydney Central Business District, the Botanical Gardens and Hyde Park. Annam Serviced Apartments offers 15 serviced studio apartments and 5 executive One Bedroom apartments. Each Studio apartment features an open plan living / sleeping area, fully self contained kitchen and also includes a Washing Machine / Dryer in each bathroom. Our One Bedroom executive apartments all include the same facilities as our Studio apartments and feature separate bedroom and living areas and an enclosed sunroom. Onsite reception is open from 8am until 9pm daily and our friendly staff is always on hand during these hours to assist you with reservations and any other enquiries you may have. Outside of these hours, our on call manager is always happy to assist in the event of an emergency. Our reception closes at 9pm each evening. Any arrivals after this time will be subject to a charge of $50 per hour until 12am and must be arranged with the hotel at the time of booking. Unfortunately we are unable to accept any arrivals after 12am and prior to 8am.